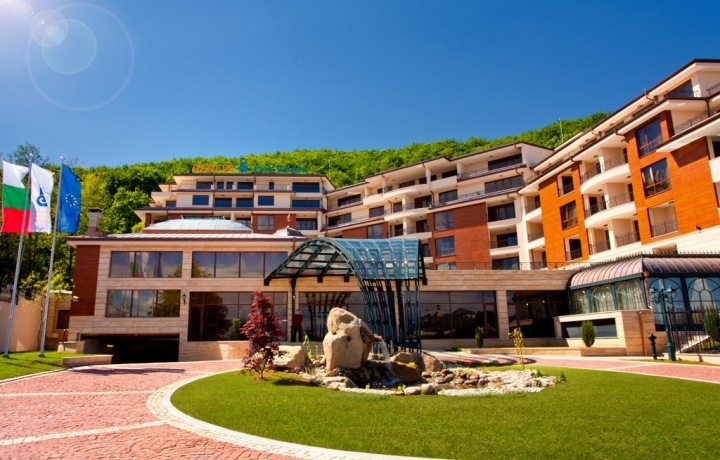 Location: Berlin Park Vitosha is the newest 4-star hotel in Sofia located at the foot of Vitosha mountain with magnificent panoramic view over the Bulgarian capital. The surrounding area of the hotel is very quiet with much greenery. In the same time the nearby "Bulgaria" boulevard offers easy and fast access to the center of Sofia city. Accommodation: Berlin Park Vitosha has 72 elegantly furnished rooms, of which 28 De Lux studios and26 suites, all with terraces revealing a magnificent view of the city, the inside garden, or the tranquility of the Vitosha Nature Park. All rooms have air conditioning with an option for individual temperature control, personal safe, free high speed Internet (Wi-Fi), telephone, LCD TV, mini bar, intercom and video surveillance systems. In the hotel: Main restaurant with 84 seats inside and 30 seats in the summer garden, lobby bar with elegant décor and pleasant atmosphere, piano bar with 70 seasts offering live performers, karaoke or DJ parties, fully equipped conference hall with daylight and up to 100 seats. Indoor swiming pool, which is equipped with specialised ultra-modern technology for purifying and ozonating the water, Fitness Center, Sauna park, which combines a variety of body purifying saunas: Russian sauna, Finnish sauna, aromatherapy sauna, steam bath with jacuzzi and relaxation area. The Beauty zone comprising elite cosmetic brands for beauty and grace combined with high-tech equipment of the latest generation. You can enjoy care for your body and face with anti-stress, anti-wrinkle, anti-cellulite treatments and polisensor therapies. There is also hairdressers, manicure and pedicure.